We hope you read this guide before your baby gets born. If your baby is already born, and you haven’t thought about this aspects, then it’s high time to look for the best baby bathtub out there. Trying to bath your baby in the normal tub, will not only be difficult to complete, but it will also be pretty dangerous for your child. Because babies have to be held all the time at first, and can’t sit up straight, there’s always the risk of getting drown. This is why buying a bathtub, specially designed for babies, is so important. It’s made of non-toxic polypropylene plastic and is very easy to clean. You can use it from the moment your child is born until he’s a toddler. For a newborn, you would use all the accessories that come with the bathtub, making sure he is safe and gets just enough water. As he grows, the tub converts as needed. So, by the time he’s a toddler he’s going to have the perfect amount of space to feel comfortable. Plug for easy drain and clean. A hook will enable you to easily hang it to dry, and eventually store it, even in smaller spaces. The “Sit-Me-Up Support” helps your child sit comfortably by the time he’s an unsteady toddler. 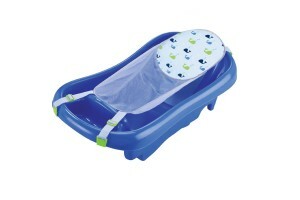 This is also a convertible baby bathtub, including a mesh sling with padded headrest. The soft pads are mildew resistant. 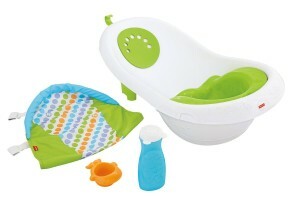 It’s design makes it comfortable for babies to stand in during bath time. 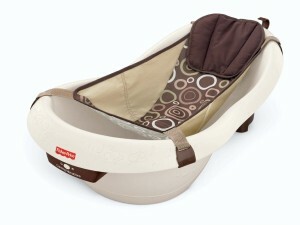 The ergonomic design has embedded storage areas for toys and bathing products. The tub features side drains that allow dirty water to exit while letting clean water enter. A pretty smart feature is the color coded built-in thermometer, that you can read easily, enabling you to always find just the right water temperature for your baby. It made to fit mot single and double sinks. The included rinse cup, that is built into the design of the tub is easy to use and of great help. 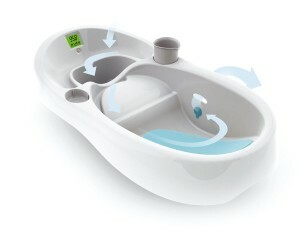 This is also a convertible bathtub, meaning it will go with your baby, being easily adjustable when the time is right. The included sling is comfortable and safe. 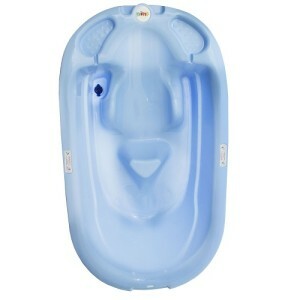 One of the feature that sets it out of the crowd is the 3-stage calming vibrations system that soothes your baby, offering him a calming bathing experience in a spa-like setting. You can drain it easily by the use of a plug. You can store it by hanging it on in your bathroom or any other storage area, without needing too much space. Like with any other kind of product, you might be able to find other options as well that might possibly be good enough. What we tried to ultimately do with our list is to help you easier find the best baby bathtubs, so you can use the time you have lost on research to do more things with your kid.